Early Education: At age 7, Adrienne Chapman started piano lessons with Beatrice L. Frank who entered her in county and state-wide classical piano competitions in Virginia. She won first place in a state-wide competition at age 12 playing a Scarlatti Sonata. She was selected to be in Vera Tilson’s Youth Choir in Arlington, VA.
College: Studied music including jazz theory, piano and voice at Laney College in Oakland, California, classical harmony at Middlebury College, Vermont, then took private voice and jazz piano lessons in Boston. At Los Angeles Community College, studied advanced jazz theory and improvisation and took private lessons from Professor Laszlo Cser. Professional: Adrienne Chapman has been teaching music and performing full-time since 2001.She has performed styles from classical and jazz to rock and blues solo and in bands throughout the U.S. since the 1970‘s. 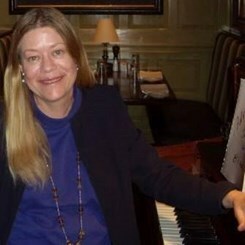 She has been teaching piano in the DC/MD suburbs since the early 1990’s and continues to gain students sent to her through referrals from families she has taught. In Ranson, WV she taught piano lessons and popular voice at Ellsworth Music from 2011 to 2017. She has long-time students who are now in their high school jazz bands. Request Lessons with Adrienne Chapman today!